The first test of strength for all European LCS teams in the Spring Split 2018 is already behind us and Week 2 will again surprise us with 10 more exciting matches on Summoner's Rift. Even the exceptional European talent factories of G2 Esports and Fnatic started below all expectations with only a single victory and a surprising defeat into the Spring Split. The duel between Splyce and the Unicorns of Love in the first week of the LCS Season 8 can hardly be surpassed in tension because only fractions of a second decided between victory and defeat. If you take a look at the standings before Week 2 of the European LCS you will find Vitality as single team on top of the standings followed by all other challengers with a record of one win and one loss except the Unicorns of Love at the bottom of the table. After all, there is a lot at stake because each best team of the Spring Split will represent its region at the 2018 Mid-Season Invitational tournament. Week 2 of the EU LCS Spring Split starts on January 26th, 2018 at 6:00 PM CEST with a new round of European League of Legends so be sure to turn on your live streams to not miss out on any action on Summoner's Rift. Team Vitality thrones alone at the top of the standings with two classy victories but the French powerhouse will be greatly challenged on the first day of the second week and the successful players will have to defend their position against the strong Fnatic team. Do they have what it takes to do the job? The duel between Fnatic and G2 Esports on the second match day also brings back playoff memories and is eagerly awaited by many European fans. No roster changes known for Week 2 of the EU LCS Spring Split 2018. All important eSports betting sites are already providing bets and betting odds for the upcoming matches of Week 2 of the LCS 2018 Spring Split. You will find a comparison of the most important League of Legends bets and betting odds as always right here. Although the Vitality team is on top of the standings they are not applicable for the best betting odds. The betting odds listed below are always subject to change, you have to follow the links to the betting sites of our League of Legends betting sites for up-to-date information. You will find detailed predictions and analysis of the upcoming matches of the EU LCS Spring Split 2018 – Week 2 right before the first game of the week. Before the start of the season, no one would have expected that there would be only a slight chance for Giants Gaming winning this game. But both the Giants and G2 had a lot of good and bad moments in the first week and when they meat each other directly, everything will depend on who gets the better form of the day. On the first matchday of the first week, Giants! Gaming managed to earn a surprising victory against the Unicorns of Love. Top laner Ruin proved to be an essential part of the team, but the other new players like Betsy and Steeelback also exceeded all expectations. On the second day of the game, the chances were good for a long time to defeat the former Giants-Roster, which is now under contract with Vitality (exception: Ruin). After a few mistakes it was not enough for the victory though and Giants heads with a 1:1 score into the second week of the season, just like G2 Esports. The team around Midlaner PerkZ also showed weakness on the second matchday and lost to the ROCCAT team. The game picked up speed very quickly and G2 was behind in gold after a short time, but was able to fight back as the game proceeded and gradually recapture parts of the map. However, a failed baron-fight made the health bars of the G2 players vanish, just like the hope for a second win on the second day of the game. Compared to the first week, G2 has to improve a lot in the tactical area, many fights were played uncleanly and the second game was lost due to rushed engages. The Botlane, consisting of Hjarnan and Wadid, left a positive impression on the team, which can in any case be rated as being of a higher quality against their rivals in the match against the Giants. For the team of G2 Esports a victory in this game is urgently needed to not lose the connection to the top ranks, after all they want to be crowned King of Europe again this year. Prediction: Based on the performances of both teams so far, we can expect an excellent and exciting game. The cautiousness of the first week will hopefully be a thing of the past, and both G2 and Giants will play aggressively and look for some early fights. However, due to the balance of power on the Bot and Mid lane, I see G2 as a clear favourite, the game will definitely be over sooner than most of the games of the first week. I expect a 1-0 victory for G2 Esports. Both teams start the second week with a score of 1:1, especially noticeable is the changing performance of ROCCAT. On the first day of the week, the team suffered a defeat against weakened Schalke 04 with their provisional Bot lane VandeR & Boris, and on the second day of the match, Roccat managed to win against their favourite G2 Esports. Splyce, on the other hand, was more consistent and lost to the top team Fnatic. I therefore expect a 1-0 victory for Splyce. While Misfits didn't change much on the roster and the top players of the last split remained the same, H2k became a completely new team, which many experts had thought was not able to reach more than the last rank. On the first day of the match, H2k were already looking grim as the team started with a loss against Vitality. On the second day of the first week, however, all critics were repaid and saw a completely different playstyle when H2k won against the favourite for the title of EU LCS, Fnatic. In this game it became clear that in the LCS everything is still possible and the smaller teams can also achieve victories. A little later was the game between Roccat and G2 Esports, in which the former once again proved to be the kingslayer of europe. In the second week of the EU LCS match, H2k will once again start as an underdog, especially after Misfits proved to be a strong team in the first few matches. The victory against Schalke on the second day of the game is a little bitter though, as the Schalker AD-Carry Upset was missing due to illness and the team had to turn the Bot lane upside down. If Hans Sama and Mikyx hadn't had such a free hand in their game, but would have competed against an equal or even superior bot lane instead, the game might have gone the other way. A few days ago it could have been said with a clear conscience that the players of Misfits on paper are clearly preferable to those of H2k. But especially Mid laner Caedrel and AD-Carry Sheriff showed good performances in the first week and changed some assessments. For Misfits it will be a very difficult match, because the team is under pressure to be considered a favourite for the LCS title and has to show what they are capable of in such matches. Prediction: In my opinion, Misifts is still the strong team and will be higher up in the standings at the end of the season than H2k. However, the first week of play has shown that surprises are possible and that the best-of-1 will make it much harder to predict the matches. I'm confident H2k will continue to win against other teams, but in this match I expect a 1-0 victory for Misfits. Prediction: Who would have thought? Team Vitality takes first rank in the EU LCS after the first week for themselves! The “Italian Stallion” Jiizuke caused a sensation with his impeccable performance, but also the bot lane with the Portuguese Minitroupax always had their opponents under control. After the disappointment of the first week, Fnatic has to be even more motivated for the game against the alleged underdog and unleash their full powers to stay in the title race. I expect a 1-0 victory for Fnatic. Prediction: FC Schalke 04 had unbelievable bad luck in the first week and had to play without their Star-ADC upset due to illness. 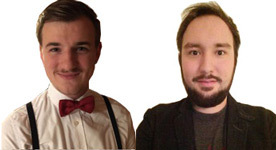 As a replacement, support player VandeR was in the unfamiliar AD-Carry position and coach Mitch “Krepo” Voorspoels took part in the game as support “Boris”. If Upset is fit again for the second week, Schalke is the clear favourite of the game, otherwise it could be very close. However, I expect a 1-0 victory for Schalke 04. Prediction: The second day of Week 2 will be started by the rather lucky teams of H2K and Giants Gaming. Both challengers started into the Spring Split with one victory and one defeat but H2K has already managed to beat a top contender which is amongst the favourites of winning the whole season – Fnatic! Especially SmittyJ on toplane and AD-Carry Sheriff made very good impressions and with a superior team composition they were simply able to outscale the Fnatic team in the later stages of the game. Nevertheless, the roster of Giants Gaming looks better on paper – with Steeelback as AD-Carry they have a very talented player in their roster capable of putting his mates on his shoulders and winning games for the team on his own. In the first game of the day I expect a very close 0-1 victory for Giants Gaming! Prediction: It was a pretty sad week for the Unicorns of Love – with no victories and two defeats under their belts Exileh and his team mates find themselves in the last place of the standings right before Week 2. In the duel against Splyce which was definitely the most exciting game in Week 1 the team was only a fraction of a second short of claiming the first victory in the Spring Split. The eye-popping base race scenario even caused inveterated League of Legends fans to scare up in their armchairs. After Kold and WhiteKnight did their utmost to keep toplaner Odoamne at bay throughout the entire game, Splyce's lategame composition was ultimately victorious. In Week 1 the ROCCAT team unexpectedly put the favourites of G2 Esports in the bounds with midlaner Blanc destroying the opposing team almost on his own. 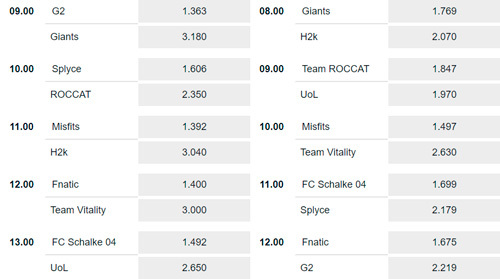 The betting odds are in favour of ROCCAT but I expect a narrow 1-0 victory for the Unicorns of Love. Prediction: Undefeated they are enthroned at the top of the standings but if you take a closer look at the opponents that faced the Vitality team in Week 1 one may come to the conclusion that they have not yet been put through its paces by the Giants! and H2K. The big contenders are still ahead of them and against the Misfits they face yet another major hurdle on Summoner's Rift on the second day of Week 2. The playoff participants of the 2017 League of Legends World Championship had to admit defeat in the opening game of the Spring Split to G2 Esports but they were able to bounce back against the FC Schalke 04 and secure their first victory in 2018. In this match they are also clear favorites and I expect a clutch 1-0 victory for the Misfits. A bitter week for the injured FC Schalke 04 but at least the weakened team managed to sneak a victory against team ROCCAT. Due to health problems AD-Carry Upset unfortunately lay flat for Week 1 and support player Vander had to take over his job at short notice. FC Schalke 04 coach Mitch “Krepo” Voorspoels made his comeback in the European LCS under his new pseudonym “Boris” after he had fallen out of favour with his former employer Riot Games where he worked as a LCS caster due to some compromising photos and actually wanted to stay out of the public eye. So far no news about the health status of Upset is known but the exact starting line-up of the Schalke 04 team will surely be announced soon. Nevertheless, with Vizicsacsi in their starting roster they have probably the best European toplaner of recent years and also midlaner Nukeduck is greatly underestimated by many experts. Even with the provisional squad on the botlane the team is still extremely dangerous for any opponent. The Splyce team on the other side was able to beat the Unicorns of Love by a narrow margin but Nisqy and his teammates were not able to show more than glimps of brilliance in the first week. Toplaner Odoamne in particular was put under that much pressure by WhiteKnight and Kold that such a frustrating game would have tilted every solo queue player into nirvana. Even Jungler Xerxe doesn't seem as fresh and aggressive as he used to be wearing the jersey of the Unicorns of Love and kaSing couldn't find his way back to his former top form yet. Nevertheless the Splyce team seems to have at least a rudimentarily understanding of the current meta game and are therefore always good for a surprise. With the FC Schalke 04, however, they face an unpleasant opponent. Prediction: The outcome of this game depends on several factors, depending on whether AD-Carry Upset is fit enough and whether he was able to train with the team during this match week. In that case Nukeduck and his teammates will have a clear advantage but if Boris and Vander will occupy their botlane again this match could also be in favour of Splyce. I expect the best for the players in the white-blue jerseys and predict a 0-1 victory for FC Schalke 04. The most anticipated match of the week and the moment that countless fans have been waiting for for a long time: LET' S GET READY TO RUMBLE… Fnatic and G2 Esports clash against each other on Summoner's Rift as the grand finale of EU LCS Week 2. Both teams started into the 2018 Spring Season as clear favourites but both teams also had to surrender unexpectedly to the underdogs in Week 1. The Fnatic team already had the early game against H2K in their pocket but the H2K team's lategame composition was able to stall against Fnatic long enough to turn the game around. The current meta game is not only a headache for the favourites of the European and North American LCS but also South Korean top teams like SK Telecom T1 had to give up valuable points because they lost important games in the pick-and-ban phase. G2 Esports started with an excellent victory against the dangerous Misfits into the 2018 Spring Split but then had again to admit defeat to the “kingslayers” of Team ROCCAT. The individual parts of the team are excellent but the chemistry between the players is not quite right yet and we will only see how high the skill ceiling of this new G2 Esports iteration really is in the next few weeks. If you take a look at the latest results of these two teams G2 Esports always had Fnatic's number in their LCS playoff matches. Nevertheless Fnatic made a stronger impression in Week 1 but as soon as the individual pieces of the G2 Esports puzzle finally click together we are facing an exciting game. The two favourites for the EU LCS Spring Split crown meet for the first time in the regular season, don't miss turning in for that action! Prediction: Get ready for popcorn, chips and breathtaking League of Legends action when Fnatic and G2 Esports finally meet again on Summoner's Rift. The Fnatic team is more experienced in (almost) this roster constellation, therefore I will trust the betting experts and their betting odds and predict a close 1-0 victory for Fnatic.